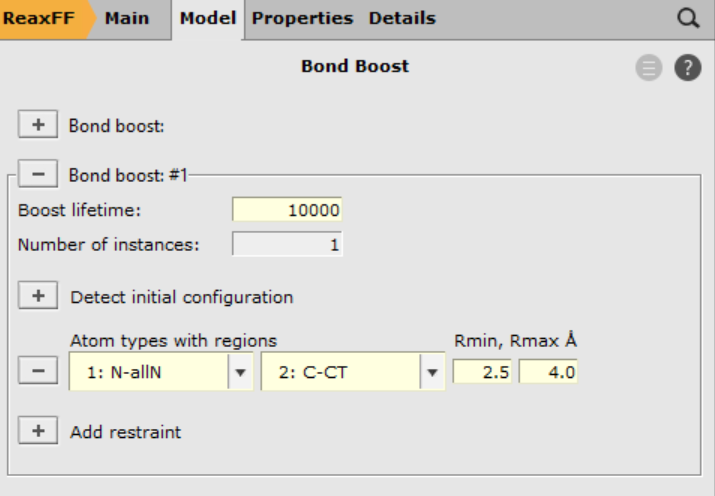 This tutorial requires the installation of an ADF2018 for the bond boost acceleration method. 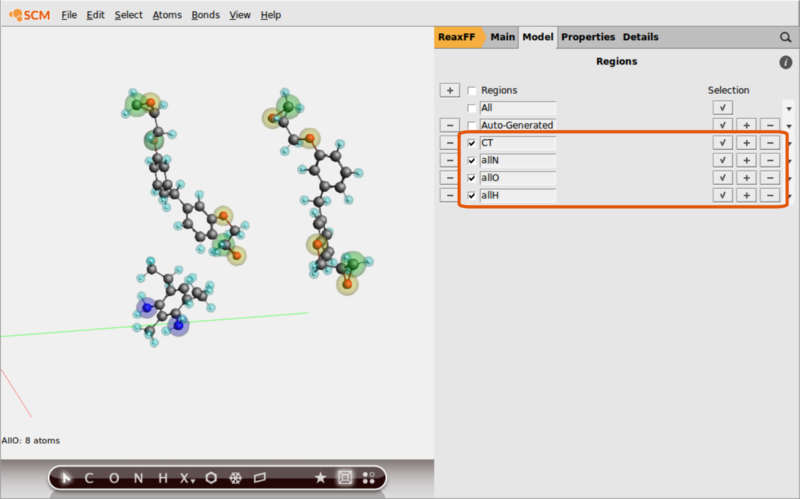 It will demonstrate how the bond boost acceleration method can be used to drive the non-catalyzed epoxide - amine polymerization reaction with the aim of generating highly crosslinked epoxy polymer structures for further simulations, e.g. the prediction of mechanical properties . In other words, it is not the purpose of this tutorial to capture or simulate the kinetics of the polymerization reaction but to generate realistic atomistic models of epoxy polymers. 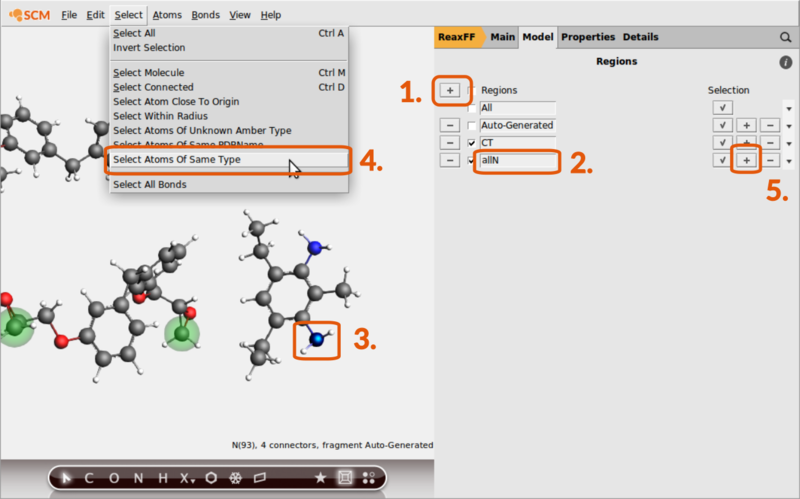 If you are not familiar with using the GUI yet, you might take a look at the ReaxFF GUI tutorials before continuing. 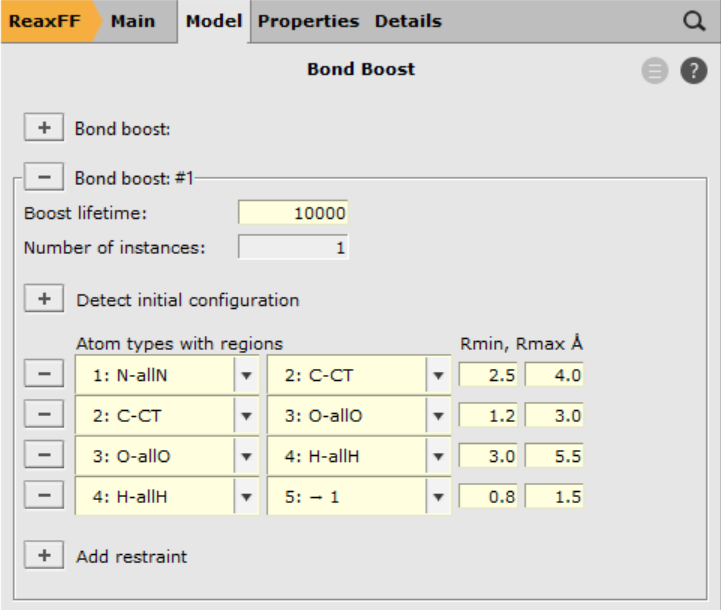 To accelerate a reaction with the bond boost method, ReaxFF needs to be provided with a set of atom distances that define a preliminary complex which could lead up to the transition state of the reaction. If this complex is formed during the dynamics, external forces are applied to support bond breaking and bond formation for a user defined set of bonds. This ‘boost’ lasts for user defined time during which the reaction may or may not occur. 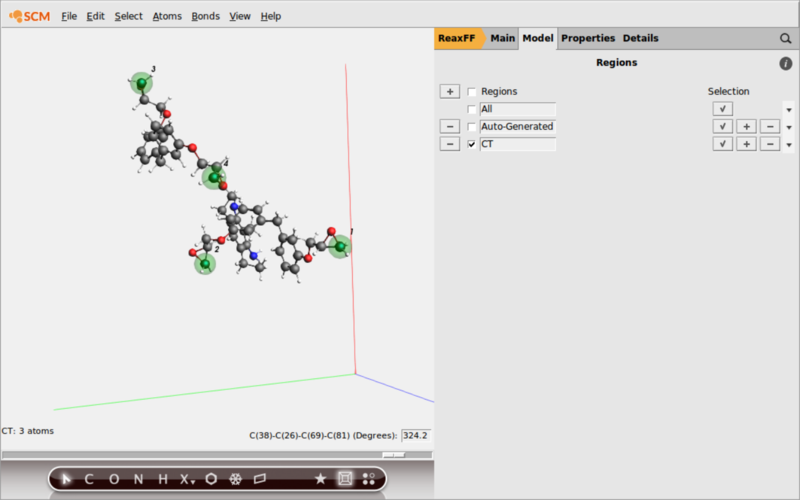 You can hold down the SHIFT key to select multiple atoms in the molecule view. Make sure that the atoms of the previous region assignment are not selected anymore when assigning a new region. Trying to assign one atom to multiple regions is a common source of error. the aim is to support the breaking and forming of bonds but still allow the reaction to fail. The above settings have been choosen empirically. A more thorough assessment of energetics based on ab-initio calculations is presented in the publication by A. Vashisth et al. This tutorial employs the dispersion corrected force field, that has not been optimized for usage with the bond boost. This force field has been used successfully in the study by M.S. Radue et al. The results might be improved by using the force field CHON2017_weak_bb.ff fitted for usage with the bond boost method (A. Vashisth et al. ). 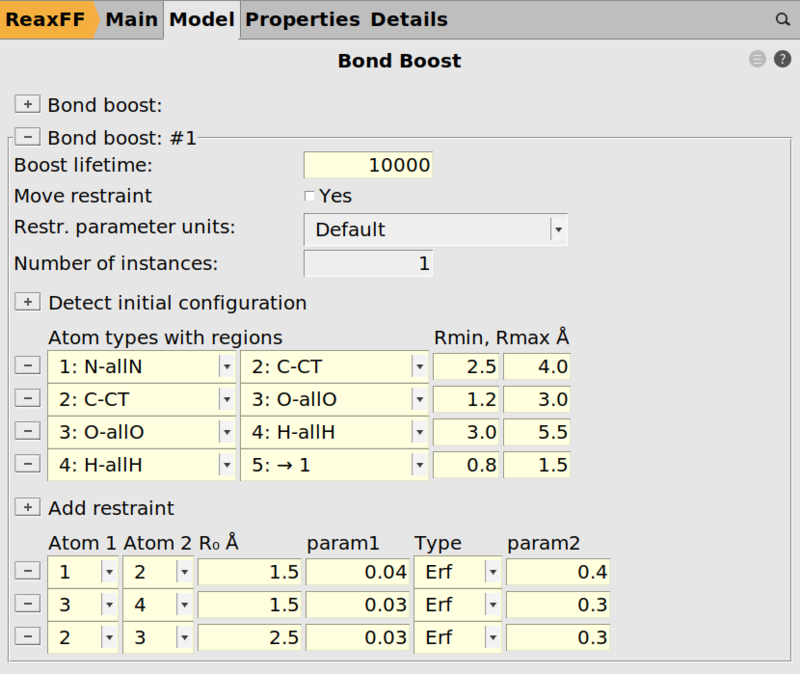 However, note that switching the force field will require tweaking the bond boost settings. By employing random starting conditions the workflow should be able to produce different polymer structures that can be used for averaging when the quantity of interest. e.g. Young’s modulus, is calculated. The workflow presented here has been written in Python and makes use of the PLAMS library. It can be executed as is with the plams interperter that is shipped with any ADF install. 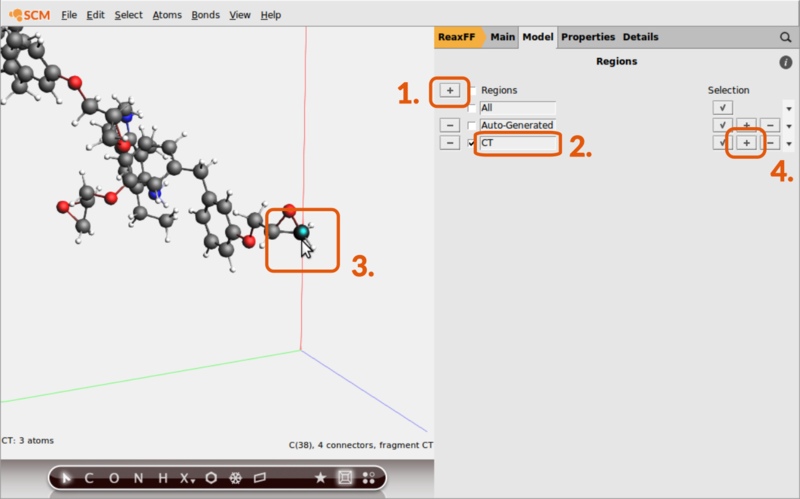 The generation of a random starting structure is acchieved by the following approach: Based on a user specified ratio of resin:hardener, the resin and hardener molecules are placed on a regular grid with the help of utility script pack-box.py (see below for details on how to use your own molecules). # how much MD steps for the sim. annealing? Starting from 298.0K the system is heated up to temperature of 600K and kept there 50000 steps before cooling down to room temperature with the same rate again. The results of this calculation are found in the plams results folder, inside the folder entitled SimAnnealing_orig-TGAB_DETDA_2. We found that running a preliminary boost in which only half the possible cross linking reactions is boosted, supports the formation of polymer structures with higher cross linking ratios. 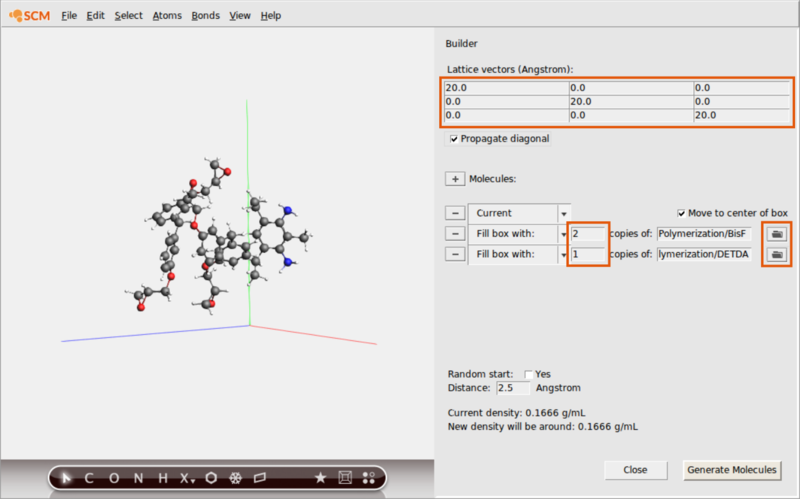 The easiest way to do so is, to assign two different regions to the N-atoms of the hardener, i.e. N1 and N2. # how much MD steps for the 1st boost? # temperature during the 1st boost? This will only show cross linking reactions that reduce the total number of molecules but this is true for the majority of reactions in the first stage. In this stage all constraints on the bond boost are dropped by taking the geometry resulting from the previous bond boost run and changing those atom labels reading N2 to N1. With the tracking options remaining unchanged, all cross-linking reactions involving the N-atoms of the hardeners will be boosted. At the same time, a compression regime is used that slowly shortens all three lattice vectors of the periodic cell until the target density, e.g. 1.2 kg/l, is reached. The default compression rate applied is -0.0001 Å / Iteration. Every 20 000 iteration the structure is subject to a geometry optimizion w. fixed lattice vectors to account for relaxation processes. The compression/geo-optimization step is repeated until a maximum number of iterations or the target density of the polymer is reached. Running NPT dynamics to equilibrate the polymer structure to athmospheric pressure will have the same effect but takes much, much more time to equilibrate. Note that M.S. Radue et al used a compression scheme in their study as well. Of course the structures generated by this workflow should be equlibrated before production use, e.g. for the prediction of mechanical properties. # How much MD steps before GeoOpt? # how much geo opt iterations? 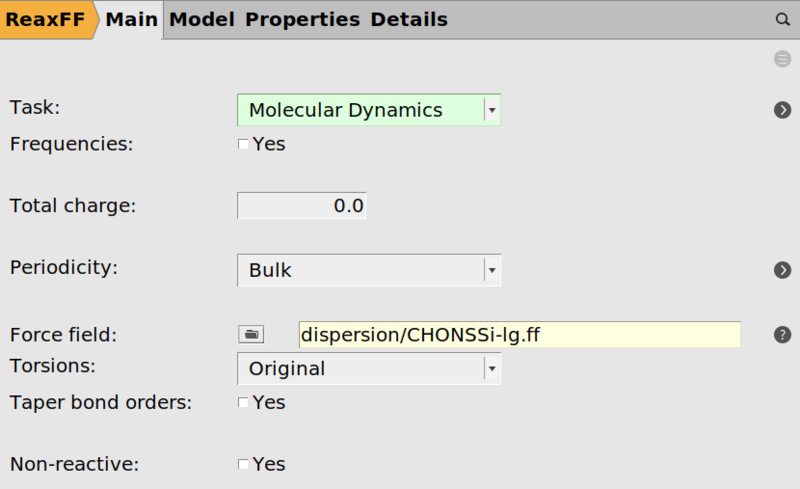 indicate that the polymer created from TGAP and DETDA (from the example calculation) reached the target density during the MD run labelled MD_1_7. The trajectory is then located in the folder plams.10547/MD_1_7/MD_1_7.kf The naming of the PLAMS results folder will be different with each run, ensuring unique naming, even in the case of a complete rerun. the max. cross linked density will be calculated on printed on the screen. The temporal evolution of the cross-linking is written to a file called cross-linked-density.out. The python script used for the calculation of cross linking ratios uses the atom types defined in the force field. If used with a different force field than dispersion/CHONSSi-lg.ff, those need to be adjusted in the top line of the script.